Looking for a powerful true story? 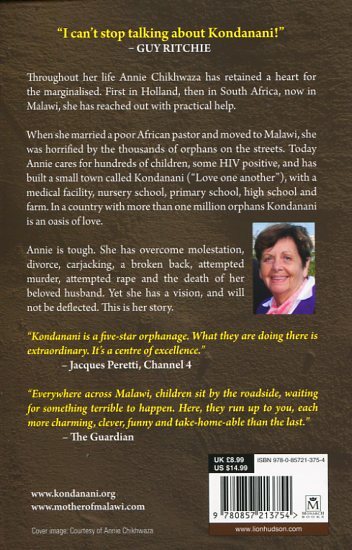 Annie Chikhwaza, dubbed the ‘Mother of Malawi’, tells her incredible life story in her inspiring biography – her difficult childhood, her abusive marriage, and her globally recognised missionary work. Annie was launched into the public eye when Madonna adopted a child from her orphanage. Through this story of interest, Annie’s life and charity received much praise through the media coverage by journalist Jacques Peretti and other newspapers (The Sunday Times, The Guardian) and TV stations (Channel 4). This book tells her story, how this Dutch girl grew up to become an international inspiration. The Village called Kondanani (which means, ‘love one another’) is described as an oasis of love. Her incredible work has inspired celebrities, attracted media attention and will now, thanks to this book, inspire thousands more. Annie Chikhwaza runs an orphanage in Malawi with great love and equally great efficiency. Born in Zimbabwe in 1962, Al Gibson graduated with a degree in journalism. Since 2001 he has lived and worked in Britain with GOD TV as their Central Communications Officer. Mother of Malawi by Al Gibson was published by Lion Hudson in April 2013 and is our 1240th best seller. 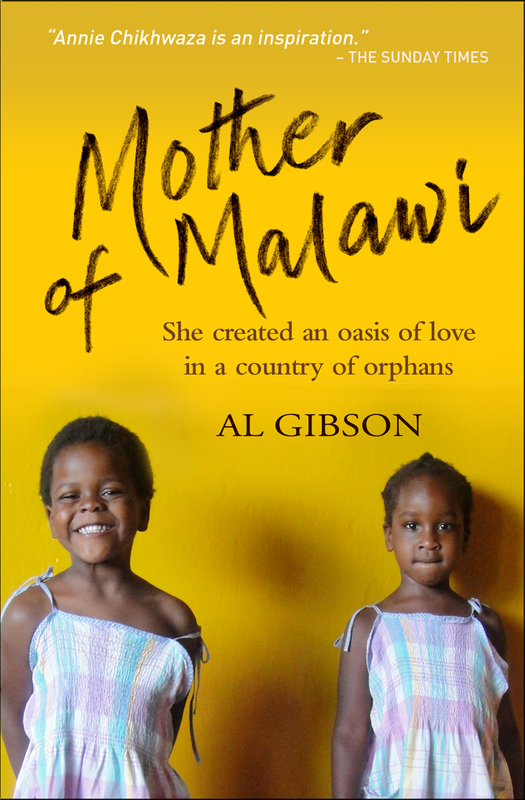 The ISBN for Mother of Malawi is 9780857213754. Antje is an amazing woman and her story deserves to be told. Her strong personality would have set her apart to achieve in any walk of life, but the hardships she endured are harrowing. If you wonder why some people suffer so much, this story testifies to the enduring love of God and His power to bring life out of brokenness. Antje heard God's call on her life at 15 and responded wholeheartedly, but her early experiences of abuse made her susceptible to depression and a dreadful first marriage. Through it all, she found God remaking her and eventually enabling her to make a new life for abandoned orphans in poverty stricken Malawi. It is a wonderful testimony to the grace of God. I would have preferred her story to have been told by a female author, more able to empathise with Antje's predicaments. Although sympathetic and admiring, I felt Al Gibson tended to preach in places. The links with Rhema Church South Africa and God TV were interesting and showed their positive role in establishing Antje's ministry. Take a peek at some articles related to Mother of Malawi. Got a question? No problem! Just click here to ask us about Mother of Malawi. Annie Chikhwaza grew up in Holland. In struggling to come to terms with her abuse as a child she tried to commit suicide but was dramatically converted through the ministry of Brother Andrew. She then began to minister to the poor and marginalized on the streets of Amsterdam and in the volatile townships of South Africa during the height of the apartheid era. Having survived an abusive marriage and the turmoil of divorce she married a poor African pastor and went to Malawi to start an orphanage. Today Annie has nearly 200 children in her care, many of whom are HIV positive, and she has built a small town called Kondanani ('Love one another'), which boasts a care facility, several children's homes, a nursery school, primary school and farm. Kondanani is an oasis of love in a country with more than one million orphans. It has attracted the attention of the media all around the world and a host of celebrities, including Madonna who has adopted two of her children. "Kondanani is a five-star orphanage, what they are doing here is extraordinary. It's a center of excellence." - Jacques Peretti, Channel 4. "I can't stop talking about Kondanani!" - Guy Ritchie. "Annie Chikhwaza is an inspiration" - The Sunday Times.